Self-feeders are useful whether you have a large or small farm. A good self-feeder does most of the work of feeding your goats for you. Self-feeders can also help cut down on the amount of feed and hay that gets wasted by your goats or consumed by wild animals. You can construct a useful self-feeder at home if you have the right materials and a basic knowledge of how to use tools. Goats thrive when they primarily consume forage such as good quality pasture or unlimited access to quality hay. A hay feeder is designed to provide adequate access to the hay without allowing the goats to pull too much out of the feeder at one time, limiting wastage. Your goats are able to choose how much hay they consume and you can fill these feeders with several days worth of hay, saving yourself the daily task of bringing hay to your goats. A goat hay feeder can be constructed by building a large wooden box and lining it with wire mesh that has openings which are no more than 1 inch wide. Fill the box with hay and allow the goats to eat the hay by pulling the hay through the wire out of the box. You should position your feeder so that it is a couple of feet off the ground, which will help keep the inside of the feeder free dirt. Some individuals opt to hang the feeder from the roof of a barn or shelter to make it more difficult for goats to climb. Most automatic feeders are constructed by fastening a 5-gallon bucket or similarly sized canister on top of a sturdy rubber feed dish. Drill a small series of holes in the bottom edge of the bucket so that feed that is poured into the top of the bucket will leak out the holes and into the feed dish. This automatic feeder will automatically replace feed that is eaten with the help of gravity. A lid on the top of the bucket will prevent your goats from eating all the feed out of the feeder at one time. The downside of a homemade automatic grain feeder is that it can be difficult to avoid giving your goats too much grain. Goats only need limited amounts of grain, especially if they are turned out on a good pasture. 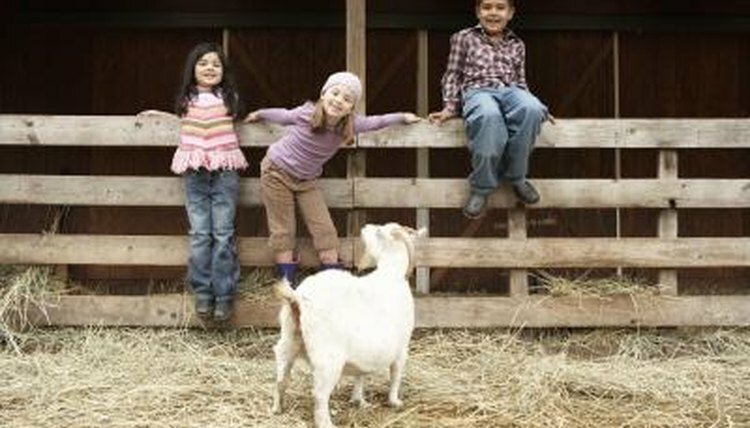 According to Oregon State University, an adult goat typically needs to consume between 1 to 2 lbs of grain per a day. While some goats will only eat what they are hungry for, others will choose to consume as much feed as they can hold. A goat that overeats may wind up obese or suffer from other health problems. If you have the technological capabilities, you may want to build a feeder that works off a timer, opening to release a specific amount feed at designated intervals.